This time every year, Christians around the world prepare to celebrate the Church Holiday of Easter. In-fact, Easter is considered the most Holy Day on the Church Calendar because it’s the day that we celebrate the Resurrection of the Lord Jesus Christ. Jesus’ Resurrection is a really BIG deal! Jesus was the Firstfruit Wave Sheaf. In those days, each family brought a single bundle of their firstfruit of the barley crop to the Temple on the day after the Sabbath of the first day of unleavened bread and the priest would then wave it before Yahweh. This was considered the “early firstfruit” – the “latter firstfruit” being at the end of the 50th day from this time, which from the Greek word has been called Pentecost (meaning fifty), or Shavuot in Hebrew. The count of 50 days in-between the early and latter firstfruits was called “the counting of the omer”. If the wave sheaf was ACCEPTED by the Lord, then so would the entire harvest be accepted. Jesus often used harvest parables to teach us about the Great Harvest of souls. Jesus WAS the Wave sheaf offering, and because He was accepted by God as the Sacrificial Lamb who takes away the sin of the world, the ENTIRE HARVEST (you and me) will also be accepted by the Lord! It’s really a beautiful picture! Jesus’ statement in Matthew 12 had always left me wondering about the true timeline of Jesus (Matthew 12:38-40). Jesus told the Scribes and the Pharisees (the Jewish leadership that desired to kill him) that the ONLY Sign He would give them to PROVE that He was the prophesied MESSIAH is the sign of Jonah. If you don’t know the story, Jonah was an Old Testament Prophet in the Northern Kingdom of Israel (The northern ten tribes of Israel). He was sent by YHWH to Ninevah, the Capital of Assyria, to warn them that if they did not repent, the God of Israel would judge them. The Assyrians worshiped the false “godess” Ishtar, not the God of Israel, YHWH Elohim. Jonah did NOT want to go to WICKED Ninevah, so he boarded a ship that was heading the opposite direction. When a great storm came upon the ship, Jonah KNEW that God was angry at his defiance, so he told the crew of the ship if they wanted to LIVE they needed to throw him into the sea. The crew happily complied, and Jonah was in the water prepared to drown. At that time, a giant fish (whale) came upon Jonah and literally swallowed him. Jonah remained in the “belly of the whale” 3 days and 3 nights, and then the whale miraculously “spit him up” on a beach near Ninevah. Ninevah is located near modern day Mosul, in Northern Iraq. Jesus told the Scribes and Pharisees that the ONLY SIGN He would give to prove that He was the Prophesied Messiah is the SIGN of Jonah, for as Jonah was in the belly of the whale 3 days and 3 nights, so will the son of Man be in the belly of the earth! Matthew 12:38 Then some of the scribes and Pharisees said to Him, “Teacher, we want to see a SIGN from You.” 39 But He answered and said to them, “An evil and adulterous generation craves for a sign; and yet no sign will be given to it BUT the sign of Jonah the prophet; 40 for just as Jonah was three days and three nights in the belly of the sea monster, so will the Son of Man be three days and three nights in the heart of the earth. This is where the traditional celebrations of “Good Friday” and Easter cause confusion. This MUST be a pretty important sign since it was going to be the ONLY SIGN Jesus would give to prove that He was the Prophesied Messiah. Christianity puts Jesus into the tomb on Friday night (“Good Friday”) and has Him resurrected by Sunday morning (Easter Sunday). Hmmm…I’m not a math genius, but that’s definitely not going to fulfill the sign of Jonah, 3 days and 3 nights in the belly of the earth. Then, the Lord had me do some digging to gain a better understanding as to why the discrepancy. Few “Christians” today have ever heard of the word ‘Quartodeciman’ let alone understand what it means. Yet to those Christians who lived in the last half of the second century A.D. it was very real. A great CONTROVERSY arose between the churches of the EAST and those of the WEST. 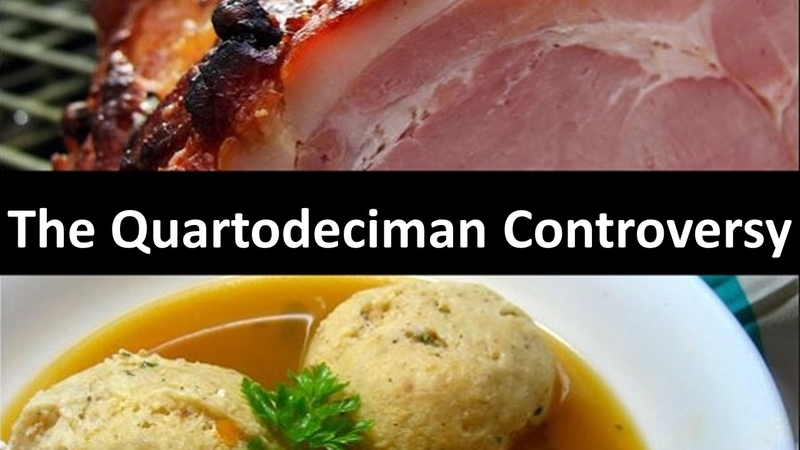 This controversy became known by the name Quartodeciman. Quartomeciman is a term used to describe the practice in the early Church Celebrating Easter on the 14th of Nisan (also called Abib). Notice – the bishops of Asia Minor – the churches of the EAST held to the 14th of Nisan for commemorating the death of Christ. It was only after much bitter disputing that the festival of EASTER became established towards the end of the second century. The Roman Catholic Church imposed it’s authority over all Christiandom to celebrate Easter and the Resurrection on a Sunday, totally divorcing itself from all things Jewish. They forget that Jesus, Himself, was a Jew. So let’s take a look at the actual sequence of events so we can better appreciate how Jesus completely fulfilled His Role as the Passover Lamb of God. First we need to understand that a 24 hour day on the Jewish Calendar begins at sunset and continues until sunset the next day. The Jewish people call the evening of the new day “Erev” which literally means twilight or sunset. Nisan is the first month on the Jewish Agricultural Calendar, and the month that the Passover is celebrated. We know from Scripture that Jesus died ON the Passover, the 14th of Nisan on the Jewish Calendar. This past Sunday, April 14th, was officially Palm Sunday, the day that the Church celebrates Jesus’ Triumphant entry into Jerusalem. On the Jewish Calendar, this past Sunday (April 14, 2019) was Nisan 9, and although not the actual day that Jesus rode into Jerusalem, something significant did happen on that day. During the time of Jesus, Nisan 9 began Thursday at sunset and continued until Friday at sunset. Jesus and His 12 Disciples reclined at the table with their Friends Mary, Martha, and Lazarus. Mary anointed Jesus with a very costly perfume. What Mary probably didn’t understand is that she was anointing His body for burial. John 12 Jesus, therefore, six days before the Passover, came to Bethany where Lazarus was, whom Jesus had raised from the dead. 2 So they made Him a supper there, and Martha was serving; but Lazarus was one of those reclining at the table with Him. 3 Mary then took a pound of very costly perfume of pure nard, and anointed the feet of Jesus and wiped His feet with her hair; and the house was filled with the fragrance of the perfume. During the time of Jesus’ final week, Nisan 10 began on Friday at sunset and continued until Saturday at sunset. The Triumphant entry of Jesus into Jerusalem through the Eastern Gate did happen on Nisan 10! In the days of the Exodus, the lamb was selected on Nisan 10 (Exodus 12:3-5). On Nisan 10, Jesus rode into Jerusalem on a donkey and was selected to be the perfect lamb of God by the Jewish people. The people of Jerusalem did not realize that Jesus had just fulfilled not only Exodus 12 (vs 3-5), but also the Old Testament Prophecy Zechariah 9:9. 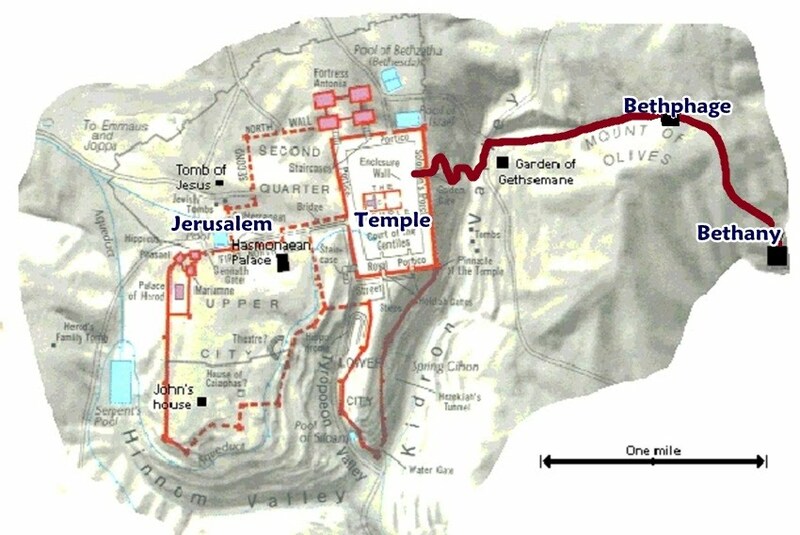 During these 3 days, Jesus rode to and from Jerusalem, where He was preaching, and Bethany where He was staying. During these 3 days, Jesus cursed the fig Tree (which represents both Israel (Jews) and the Tree of the knowledge of good and evil), He overturned the money tables of the thieves at the Temple, and He taught many lessons to the crowds via parables. Now this is where it gets really interesting. In the days of Jesus, the Jewish people had already changed the way that the Festival of the Passover was celebrated. In the book of Exodus, the Passover and Feast of Unleavened Bread were separate “feasts”. The Hebrew word for “feast: means appointed times, or God’s appointments with mankind. The Passover was to be celebrated on the 14th of Nisan, and Unleavened Bread would be celebrated on the 15th of Nisan. This is because the Israelites cooked, roasted and ate the lamb on the night of the 14th of Nisan. During this time, the angel of death descended upon Egypt and “passed over” their homes. The next day, during the day (still the 14th of Nisan until sunset), the Israelites plundered the Egyptians, and after sunset on the 15th of Nisan, the Israelites made their EXODUS out of Egypt …BY NIGHT (Deuteronomy 16:1). This is known as “The night to be much observed (Exodus 12:42)“. First, we must receive the Passover (Jesus IS the Passover Lamb of God), and only then, can we BEGIN to make our exodus out of Egypt (sin/the world). The Israelites commemorated the Exodus out of Egypt by eating Unleavened Bread for 7 days (seven is the number of perfection and completion). Because leavening “puffs up” like PRIDE, the Feast of Unleavened Bread is a SYMBOL of our LIFELONG walk of SANCTIFICATION. We are Justified (made right with God/SALVATION) by the blood of Jesus, and we are Sanctified and washed by His Holy Spirit and by the Word of God (God’s Spirit helps us avoid sin and practice righteousness). This should be continually increasing throughout the Believer’s life. During the days of Jesus, the Feasts were no longer separate, and were combined to form the “Passover Feast”, also known as “Unleavened Bread”. While God intended the Passover and Feast of Unleavened Bread to be separate (though adjacent) observances, the Jews ended up combining the two during the Babylonian exile, as the Encyclopaedia Judaica confirms: “The feast of Passover consists of two parts: The Passover ceremony and the Feast of Unleavened Bread. Originally, both parts existed separately; but at the beginning of the [Babylonian] exile they were combined” (vol. 13, p. 169). Another critical point is that, despite Passover and the Feast of Unleavened Bread being distinct festivals, they were commonly grouped together and simply called “Passover,” or “Unleavened Bread”” Thus, when the Gospel writers mention “Passover”, or “Unleavened Bread” it can sometimes refer to the Passover sacrifice itself (Matthew 26:17; Mark 14:12), the day when the sacrifice was made (Mark 14:1), or the whole eight-day period of Abib (aka:Nisan) 14-21 (Passover plus Unleavened Bread; Luke 22:1). Matthew 26:17 Now on the first day of Unleavened Bread the disciples came to Jesus and asked, “Where do You want us to prepare for You to eat the Passover?” 18 And He said, “Go into the city to a certain man, and say to him, ‘The Teacher says, “My time is near; I am to keep the Passover at your house with My disciples.”’” 19 The disciples did as Jesus had directed them; and they prepared the Passover. On Tuesday, Nisan 13, Jesus’ Disciples asked Him where they should prepare the Passover meal. His Disciples spent the entire day securing the facility and preparing the meal. By Tuesday night at sunset (Nisan 14 – THE “EREV” PASSOVER), Jesus reclined at the Table with them. ( Psalm 23: You prepare a table before me in the presence of my enemies;You have anointed my head with oil). Jesus CONFIRMED the NEW COVENANT that was about to be written in HIS BLOOD after sunset on the 14th of Nisan, the EREV Passover. Jesus washed their feet and taught them that they too were to be servants! Matthew 26: 20 Now when evening came, Jesus was reclining at the table with the twelve disciples. After supper, Jesus and His Disciples went into the Garden of Gethsemane to pray. Here, Jesus asked His Disciples to stay awake and pray with Him. He asked them 3 times to stay awake, but they were tired and kept falling asleep. In the middle of the night, one of His Disciples (Judas Iscariot) betrayed Jesus into the hands of His enemies. An illegal trial ensued and Jesus was pronounced guilty by the Jewish Sanhedrin. The Sanhedrin did not want to get their hands dirty, so they had ROME kill Jesus for them. From 8AM until 9AM, Jesus was beaten and scourged (whipped) 39 times. Jesus was NAILED to the CROSS by 9AM (the third hour) on Nisan 14 at Golgotha, the place of the skull. Supposedly Galgotha is named “Place of the Skull” because the land topography looks like a skull. But, it has also been said that David carried the head of Goliath back to Jerusalem. It is possible the the “skull” the hill is named for represents Goliath’s skull. This is symbolic of the fulfillment of the prophecy of the Promised seed in the book of Genesis 3:15: “And I will put enmity between you and the woman, and between your offspring and hers; he will crush your head, and you will strike his heel.” The “woman” in prophesy represents both Eve and Jerusalem, and the Promised Seed is JESUS! 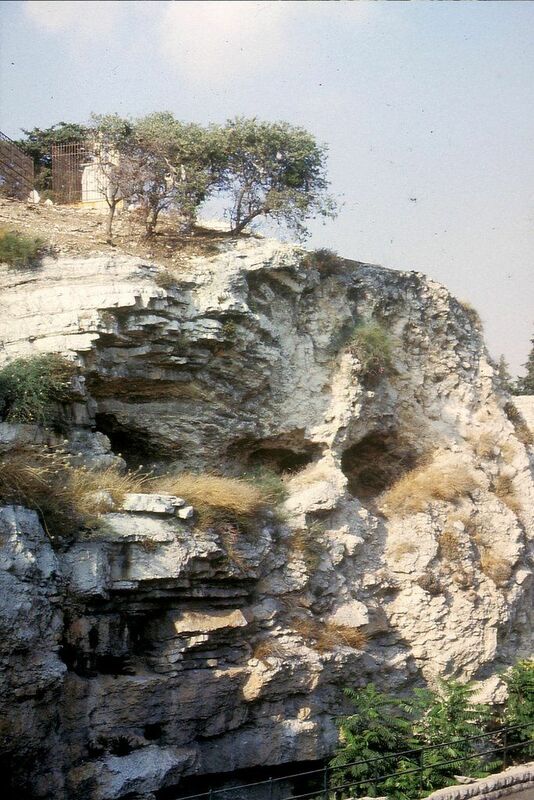 Jesus was crucified at the place called Golgotha, where His heel was bruised when He was nailed to the Cross. However, on THAT DAY JESUS crushed the head of the serpent, the devil! Goliath had been a giant, the offspring of the Nephilim (fallen angels/mankind hybrid – the seed of the serpent). Jesus hung on the Cross from 9AM until noon, when the skies grew abnormally DARK. Though it was mid-day, the skies remained DARK for 3 hours while Jesus hung on the Cross, and at 3PM, Jesus gave up HIS HOLY SPIRIT! Carrying the weight of our sin, Jesus was forsaken by the FATHER so that we would NEVER have to be forsaken! At 3PM there was a GREAT EARTHQUAKE and the VEIL in the Temple was torn in half from top to bottom! Matthew 27:50 And Jesus cried out again with a loud voice, and yielded up His spirit. 51 And behold, the veil of the temple was torn in two from top to bottom; and the earth shook and the rocks were split. Here’s where some of the confusion takes place in Christianity. The Jewish leadership wanted Jesus OFF of the Cross and in the tomb before sunset (John 19:31). Why? They wanted Him off the Cross because the ANNUAL SABBATH (1st day of feast of unleavened bread) began AT SUNSET. Christianity MISTAKENLY thinks that this the Jewish leadership was referring to the weekly Sabbath (Saturday). They are wrong. Jesus had to be OFF the cross before sunset, the start of the 15th of Nisan because the 15th of NISAN was an Annual Sabbath, a “High Holy Day”. On this day, no work was to be done, so Jesus had to be off of the Cross BEFORE sunset, the start of Nisan 15! Because Christianity does not understand the Jewish Annual Sabbaths (High Holy Days), they ASSUME that Jesus had to be off the Cross before the weekly Sabbath began, or Friday at sunset. But this is NOT right, and would NOT fulfill the “sign of Jonah” (3 days and 3 nights in the belly of the earth). In Leviticus, the 14th of Nisan (the PASSOVER) was NOT a High Holy Day (annual Sabbath), which means work could be done on THE PASSOVER! The 15th of Nisan was an annual Sabbath (high Holy Day), so no work could be done . For this reason, the PASSOVER was ACTUALLY known as “preparation day” for the Feast of Unleavened Bread (the High Holy Day) (Mark 15:42), just like Friday is the preparation day for the WEEKLY SABBATH. ‘5: These are the appointed times of the Lord, holy convocations which you shall proclaim at the times appointed for them. 5 In the first month, on the fourteenth day of the month at twilight is the Lord’s Passover. No work was to be done on the 15th of Nisan which began Wednesday night at sunset during the days of Jesus because this was an ANNUAL SABBATH. Leviticus 23 is clear that the 14th of Nisan (PASSOVER) was NOT an annual Sabbath, and work COULD be done, therefore the Passover was considered “the Preparation day” for the Feast of Unleavened Bread! Jesus’ work on the Cross was done on the 14th of Nisan, the Passover. Even in the days of Jesus, the Feasts were combined, and much of the meaning was lost. In the days of the Exodus, the Passover meal was shared through the night on the 14th of Nisan. In the morning of the 14th of Nisan, after the angel of death passed over their homes, the Israelites “Plundered the Egyptians” (Exodus 12:36). In the Bible, “Egypt” is a metaphor for the world, for sin, even for satan. (Not modern day Egyptians, but the Pharoahs of Egypt). Jesus plundered the “Egyptians” (satan) when He took back what RIGHTFULLY belonged TO HIM on the morning of the 14th of NISAN…on the CROSS. Jesus, the GREAT I AM, TOOK BACK HIS CREATION from satan!!! Come let us reason together. IF Jesus had been buried on Good Friday sunset (around 6PM) there is NO WAY He could be in the grave 3 days and 3 nights satisfying the sign of Jonah. He had told His Disciples He would RISE AFTER 3 DAYS (Matthew 27:63)! There are less than 48 hours between Friday night sunset and the “wee hours/when it was still dark” on Sunday morning (basically Saturday middle of the night). The Church commemorates Jesus’ time in the tomb from Friday night (Good Friday) until Sunday morning. This does NOT satisfy the ONLY sign that Jesus gave that PROVES He is the prophesied Messiah. But….When we understand that Jesus had to be OFF THE CROSS by the start of the ANNUAL SABBATH, then that makes all the difference and we can begin to understand the TRUTH!. Jesus was put in the rich man’s tomb (Joseph of Arimathea) by sunset on Wednesday night (Nisan 15/Feast of Unleavened Bread/Annual Sabbath) fulfilling the prophecy of Isaiah 53:9. He remained in the tomb Wednesday night, Thursday night, Friday night. (3 days/3 nights). The women could not prepare the spices to anoint his body on the annual Sabbath/15th of Nisan (Wednesday night sunset UNTIL Thursday night sunset), so they waited until Friday during the day, which is also the PREPARATION DAY for the WEEKLY SABBATH . Friday during the day, they prepared the spices until sunset on Friday. The weekly Sabbath began at sunset on Friday and continued until sunset on Saturday. The women also could not anoint Jesus’ body until the weekly Sabbath was over.Anxious to get to the tomb and anoint Jesus’ body, the women went to the tomb during the “wee hours of Sunday morning BEFORE DAYLIGHT” (basically late Saturday night). It was at this time, that they found the tomb EMPTY! Jesus HAD RISEN! Jesus was in the tomb Wednesday night, Thursday night, Friday night, and rose around the sunset Saturday night (could have risen on the weekly Sabbath, we do not know)..but had ALREADY RISEN by the wee hours of the morning Saturday night (Sunday morning BEFORE DAYLIGHT), when the women found the EMPTY TOMB! Saturday evening to Sunday sunrise: JESUS HAS RISEN! Nisan 18 at sunrise, the women find the TOMB EMPTY! In the afternoon of Nisan 18, Jesus visits the Disciples. All but Thomas are there. John 20:1: Now on the first day of the week Mary Magdalene *came early to the tomb, while it *was still dark, and *saw the stone already taken away from the tomb. Acts 1:3: To these He also presented Himself alive after His suffering, by many convincing proofs, appearing to them over a period of forty days and speaking of the things concerning the kingdom of God. Jesus Ascended to Heaven and is seated at the right hand of the Father. Acts 1:9: And after He had said these things, He was lifted up while they were looking on, and a cloud received Him out of their sight. Jesus has paid OUR debt IN FULL.